IHOP celebrates The Grinch movie with a new Grinch-inspired menu, which includes all-new Grinch green pancakes. The chain has released a commercial to showcases the delicious treat, which features cream cheese icing and a new mint hot chocolate with green whipped topping. “They’re so good they’ll warm the heart of any Grinch,” the voiceover says on the 30-second ad, mentioning that “the best part is kids eat free from 4 to 10pm”. “Do you have anything else to add, Mr. Grinch?” the voiceover asks Grinch, who is then seen making faces and pointing his thumb down. Another spot features a man giving a statement to the police about a guy covered in green hair and dressed in a Santa suit who stole his Grinch pancakes with cream cheese icing. Shown a sketch of Grinch, the man recognizes him and beggs the detectives, almost in tears, to bring his pancakes back to him. “We’re gonna get this sicko!” promises one of the investigators. 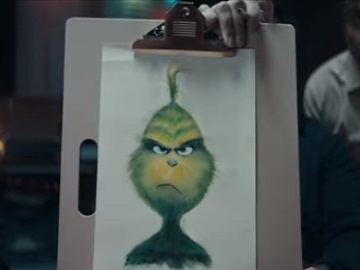 The commercial ends with the voiceover urging viewers to get IHOP’s new Grinch pancakes before they’re stolen and see The Grinch in theaters. The Grinch, also known as Dr. Seuss’ The Grinch, is an upcoming 3D computer-animated comedy Christmas film, based on the 1957 Dr. Seuss book “How the Grinch Stole Christmas!” and produced by Illumination Entertainment. Directed by Yarrow Cheney and Scott Mosier, it marks the third screen adaptation of the story and features the voices of Benedict Cumberbatch, Rashida Jones, Kenan Thompson, Cameron Seely, and Angela Lansbury. According to the official synopsis, The Grinch hatches a scheme with his trusted canine Max to ruin Christmas when the residents of Whoville plan to make their annual holiday three times bigger that year. Meanwhile, Cindy Lou Who plans to seek out Santa Claus to thank him for helping her widowed mother every Christmas, but little does she know she is trying to blow the Grinch’s cover. Originally scheduled for release on November 10, 2017, the movie was pushed back to November 9, 2018.